- by mail order direct from Fundatia ADEPT Ltd, Upper Leigh Farm, East Knoyle, Salisbury SP3 6AP, UK for £12 per copy including postage. Please order by sending payment (sterling cheques only) with your name and full postal address. 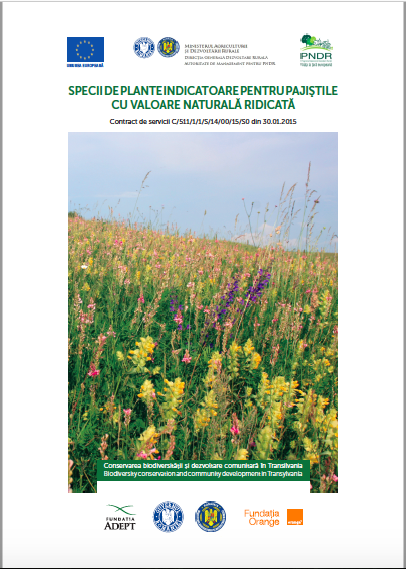 This booklet has been prepared under the STIPA project in order to raise local awareness of the importance of the dry grassland habitats and associated indicator species, and to enable farmers and local schools to participate in monitoring of indicator species. 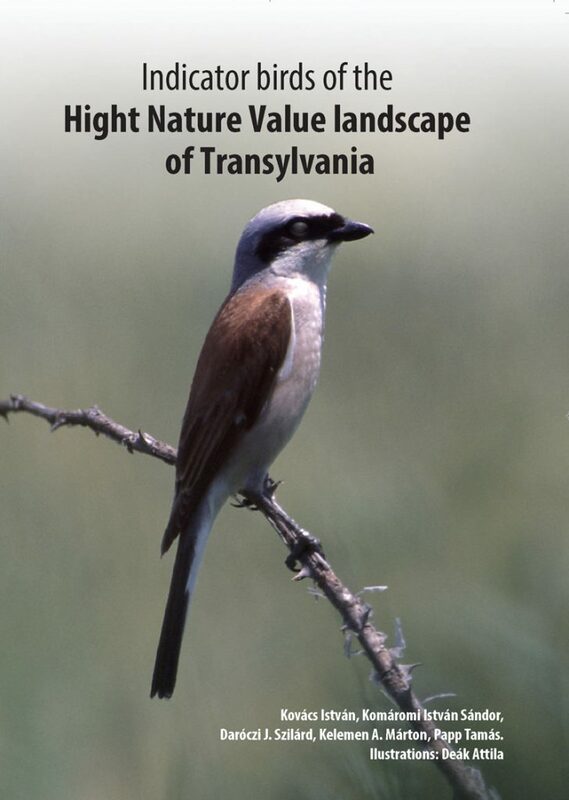 The reason these valuable and rare species have survived in the dry grasslands of Transylvania is to be found in the traditional, extensive land use of the region. 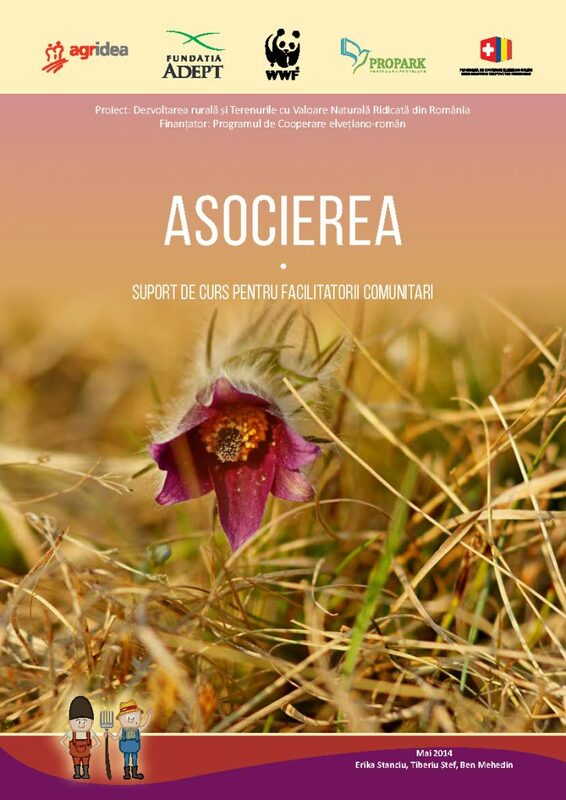 This booklet has been prepared under the STIPA project in order to raise local awareness of the importance of the dry grassland habitats and associated indicator species, and to enable farmers and local schools to participate in monitoring of indicator species. 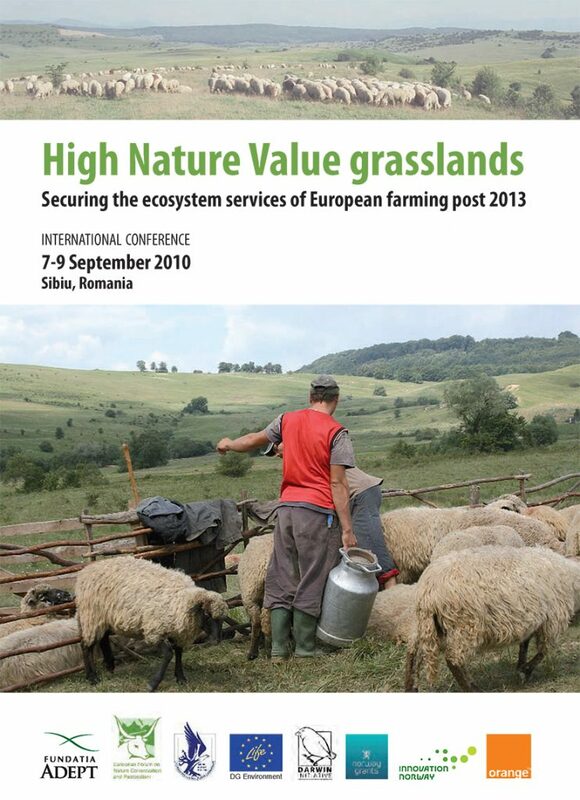 The­ meadows­ and­ pastures ­of­ southern­ Transylvania­ represent ­some­ of­ Europe’s­ most ­intact ­traditional­ farm­ grasslands. 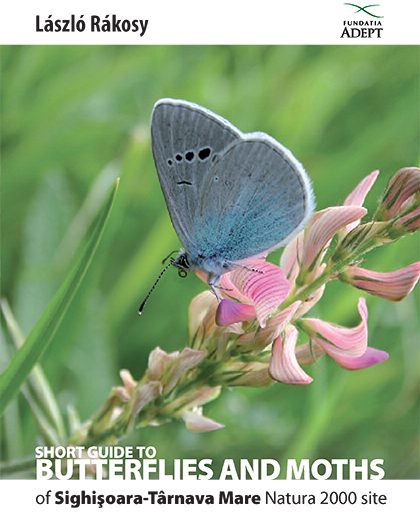 This booklet has been prepared under the STIPA project in order to raise local awareness of the importance of the dry grassland habitats and associated indicator species, and to enable farmers and local schools to participate in monitoring of indicator species. Like the famous fortified Saxon churches, these grassland landscapes are a significant element of the cultural identity of southern Transylvania and a major attraction for visitors. 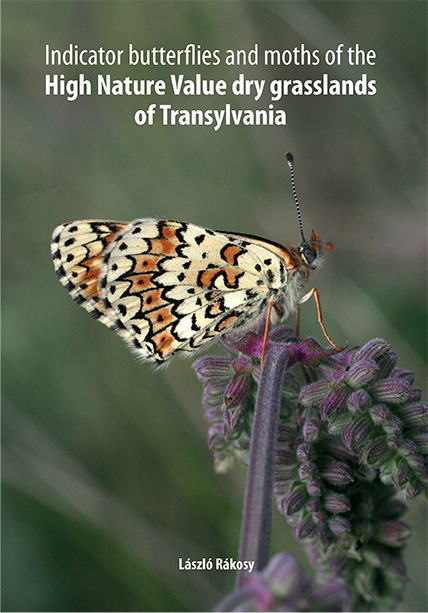 Fundatia ADEPT has launched a Brief Guide to the Butterflies and Moths of the Sighisoara-Tarnava Mare area. - by mail order direct from Fundatia ADEPT Ltd, Fundatia ADEPT Ltd, Upper Leigh Farm, East Knoyle, Salisbury SP3 6AP, UK for £6.00 per copy including postage. Please order by sending payment (sterling cheques only) with your name and full postal address. 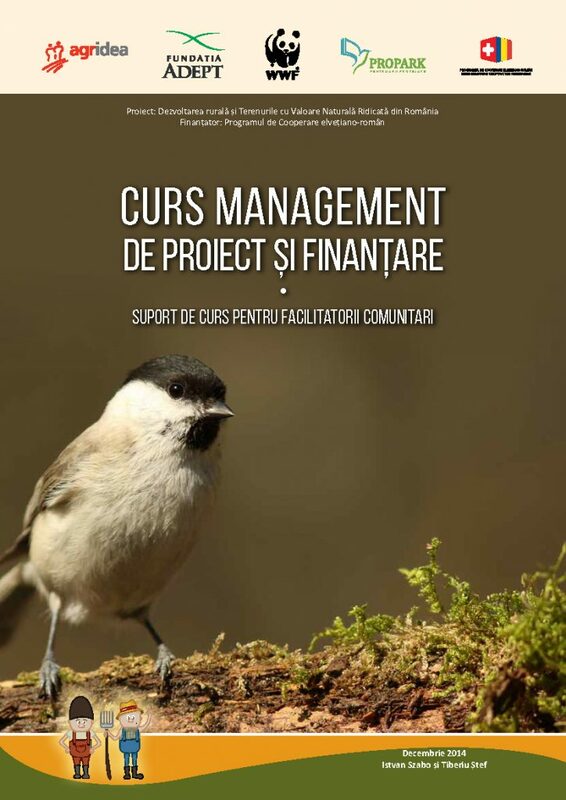 In the first part of this publication we present an overview of avifauna of the Sighișoara-Târnava Mare area, a Natura 2000 Site (SCI, Site of European Community Interest, designated under the EU Habitats Directive); the factors that threaten the populations of nesting, migratory and wintering species of birds; and general protection measures which should be taken. In the second part we have selected some representative species that every visitor has the chance to see; many are locally common but rare elsewhere in Europe. With this guide we hope to provide the opportunity for interested visitors to make acquaintance with the rich avifauna of the area. 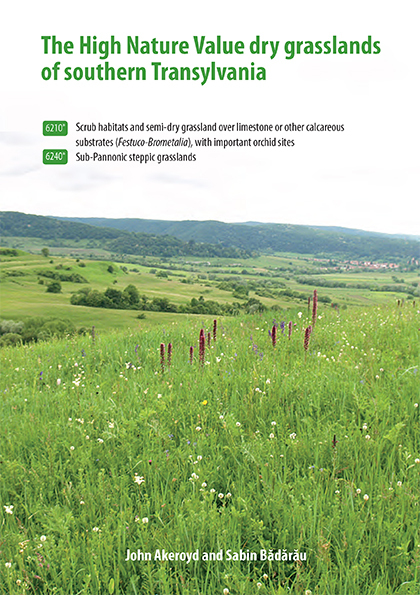 In this brochure we briefly describe floristic indicators that show the ecological quality of High Natural Value permanent grasslands in Romania. Romania is distinguished by extensive areas with meadows and pastures rich in plant species, many of which are very valuable for hay and for grazing. Many of these are important habitats (and species) protected under the EU Habitats Directive, as well as under national and international legislation. 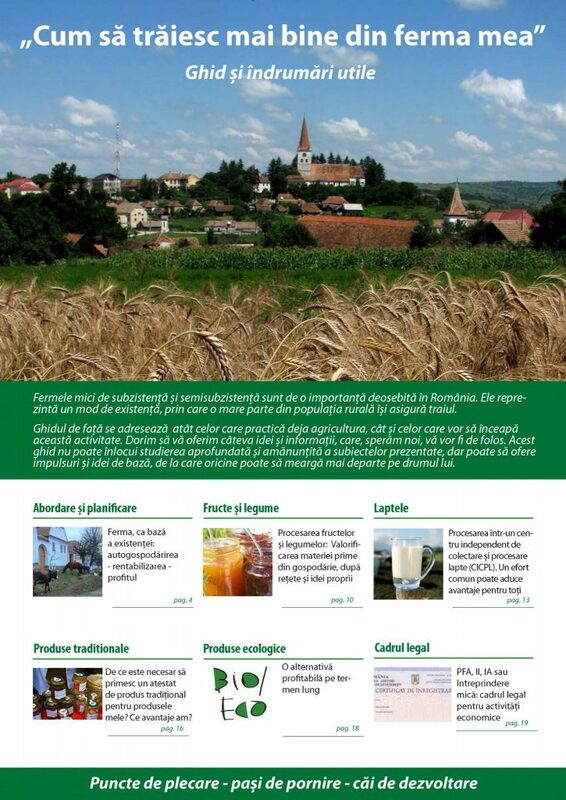 This leaflet describes a new pilot agri-environment scheme for the Târnava Mare and the Pogány havas / Munții Ciucului regions. The scheme is being run as a test in these two areas for 3 years from 2016-2018. 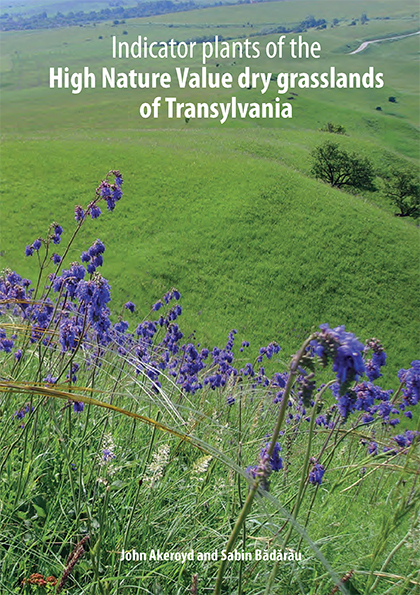 The conference brochure contains an introduction to the farming systems of the HNV landscapes of Transylvania, with case studies. An overview of the Târnava Mare area, with map. 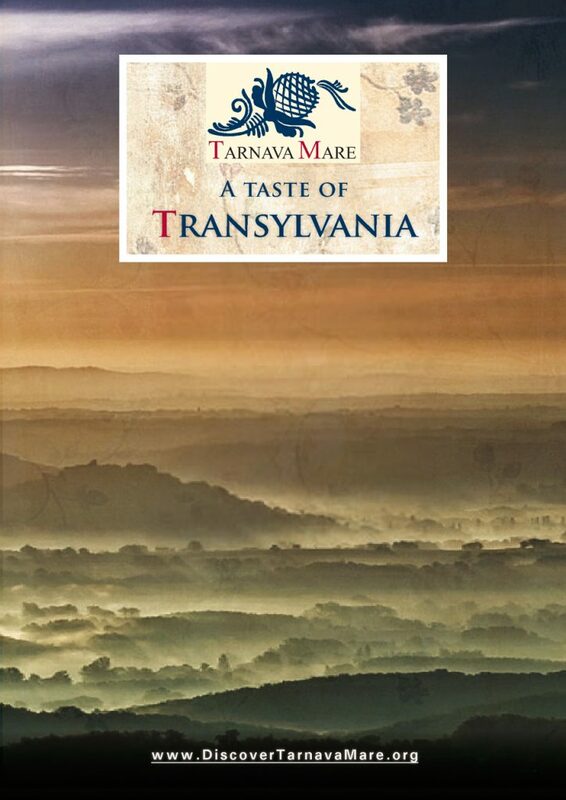 Târnava Mare provides a magical experience for the visitor, either as your main destination or as a perfect addition to any multi centre holiday in Romania. Situated in the heart of the ‘Transylvanian Triangle’ it compliments a visit to the historic cities of Brașov, Sibiu and Sighișoara. 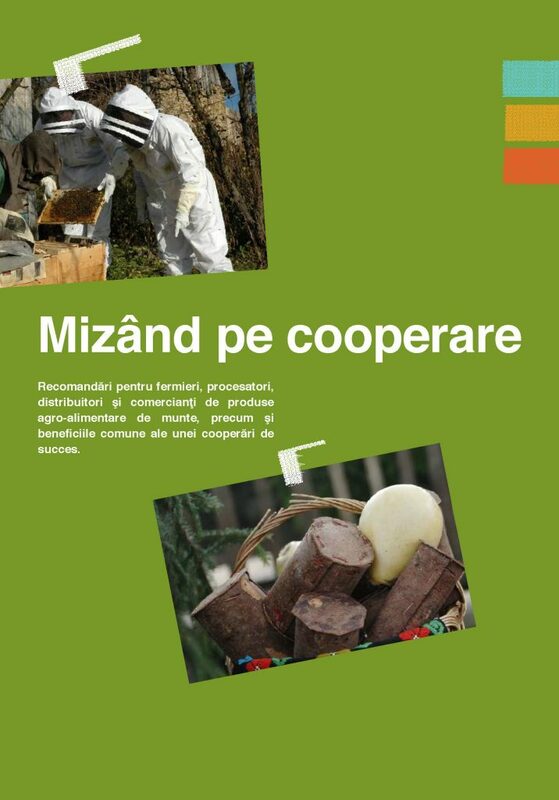 The hereby brochure is one of the immediate results of the “Bazna Pig Festival” project, implemented by Fudatia ADEPT Transilvania together with The Local Council and the Bazna Town Hall. 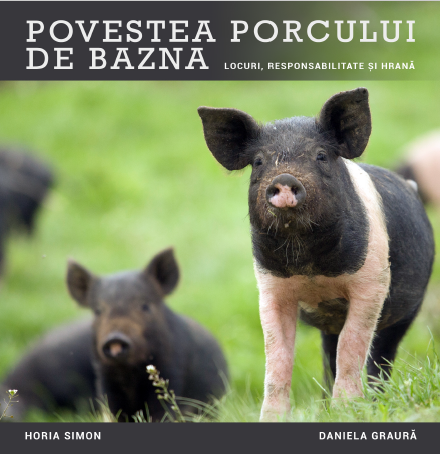 By the brochure “Povestea Porcului de Bazna” (The Story of the Bazna Pig), we bring forward the importance of conserving the traditional knowledge, transmitted throughout the generations, and of local breeds, well adapted to the surrounding environment unlike other breeds that evolved as a consequence of increased consumption. Actually, we underline the importance of product traceability and of the relationship that should be developed between consumers and producers and of the fact that, choosing local products we encourage the sustainable development of the small producers and that such products can contribute to the image and reputation of the area on local, national and international plans. 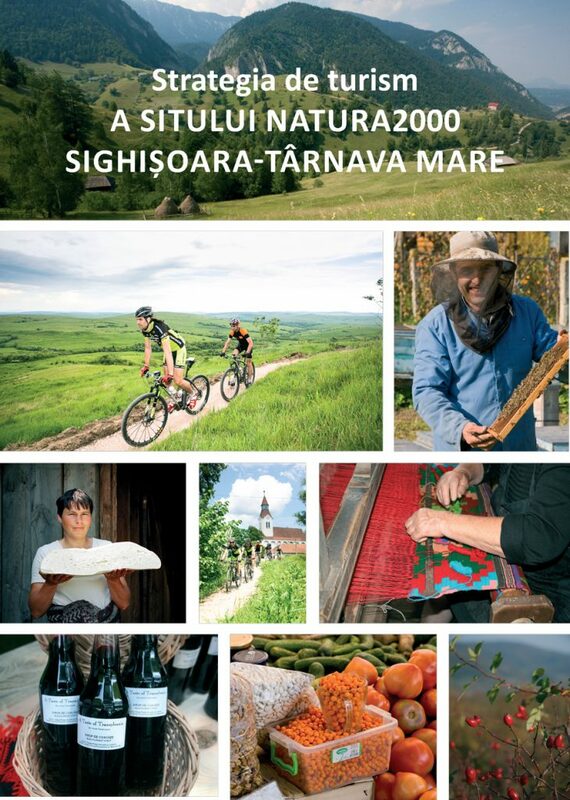 A 12-page brochure describing local food and its traditional production in the Târnava Mare area. Giving proper value to local food and local tourism is key to the sur- vival of the area. Friendly villagers, traditional homemade food and the timeless rhythms of country life such as the evening procession of cows returning from pasture give the traveler a glimpse of an older Europe, one not seen for generations elsewhere. 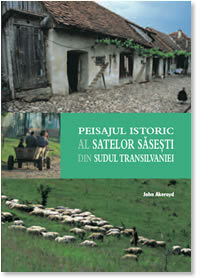 Find out more about Târnava Mare using detailed maps of the long-distance trail and shorter walking routes in the area. 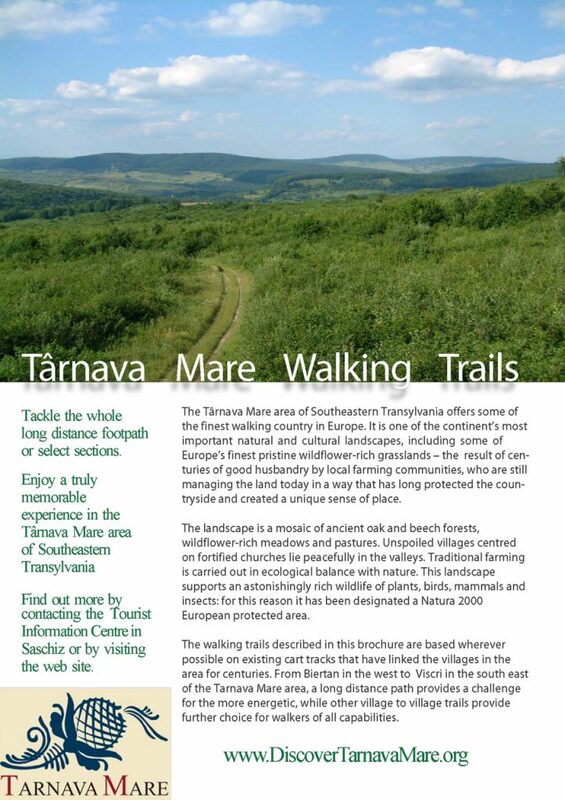 The walking trails described in this brochure are based wherever possible on existing cart tracks that have linked the villages in the area for centuries. From Biertan in the west to Viscri in the south east of the Târnava Mare area, a long distance path provides a challenge for the more energetic, while other village to village trails provide further choice for walkers of all capabilities. A brief guide about Saschiz, its history and culture. 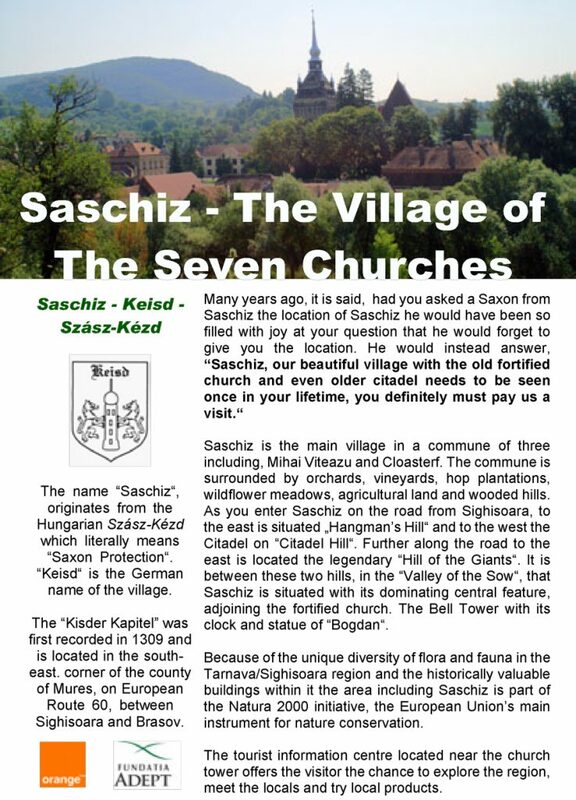 Saschiz is the main village in a commune of three including, Mihai Viteazu and Cloasterf. The commune is surrounded by orchards, vineyards, hop plantations, wildflower meadows, agricultural land and wooded hills. 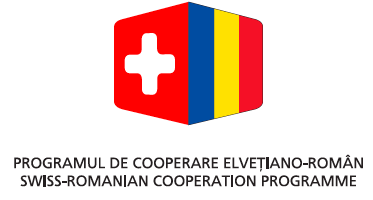 We have made this action plan to develop a sustainable tourism sector, to support other rural activities in the area, taking into account Dealurile Târnavelor Local Action Group’s development strategies and consulting the local actors, private partners, and authorities, as there is a need for a common and correlated vision. 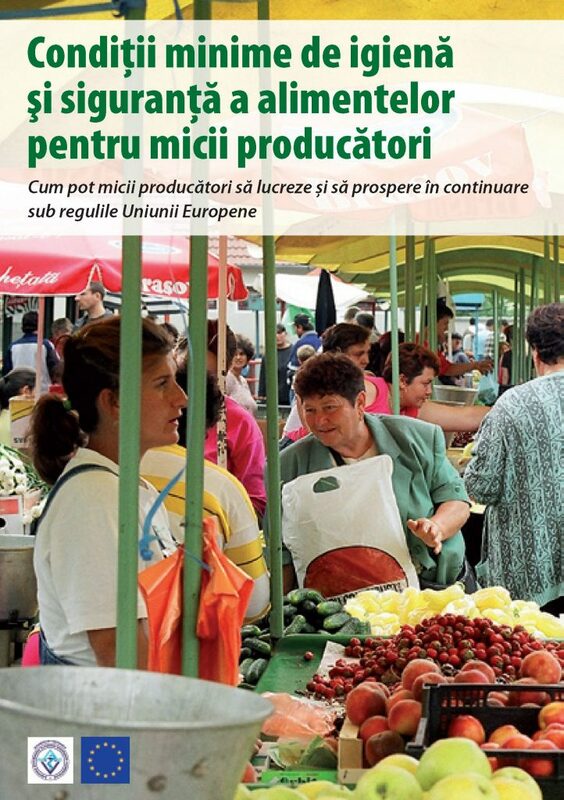 This 24-page booklet for small producers was launched in Bucharest in 2008. It was written by ADEPT Foundation, Milvus Group and WWF. 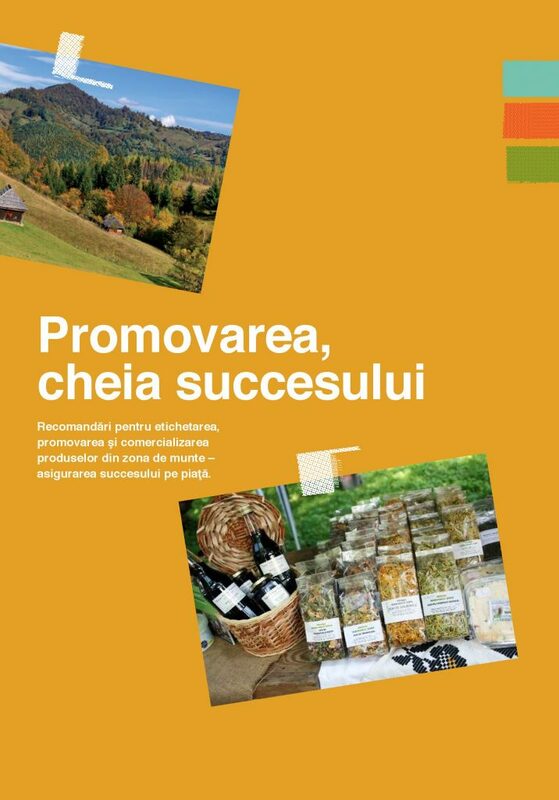 The aim of the booklet is to clarify the minimum conditions which small producers have to meet after Romania’s EU entry, and to help small producers - so important for Romania’s rural economy, landscape and culture – to prosper within the European Union. 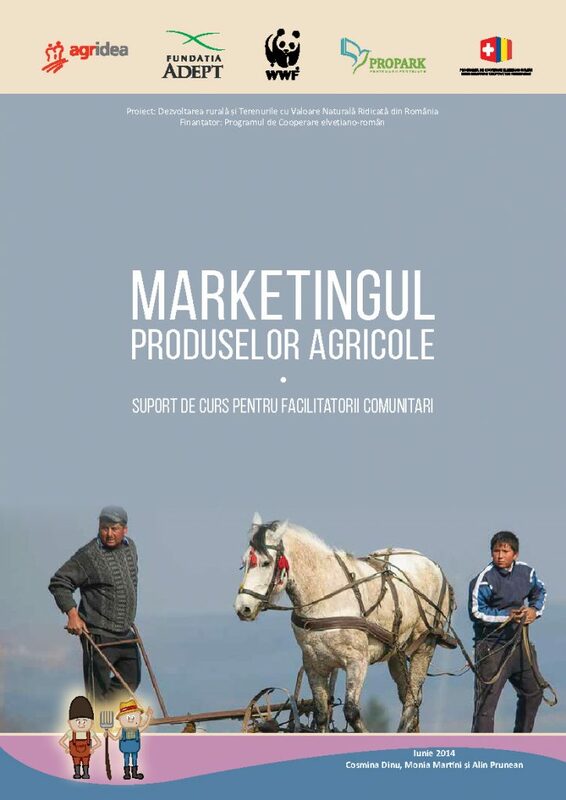 The booklet has been produced with support of ANSVSA (National Sanitary Veterinary & Food Safety Authority), EU Representation in Bucharest, the Ministry of Agriculture and Rural Development, Orange Romania, and Ratiu Family Foundation. 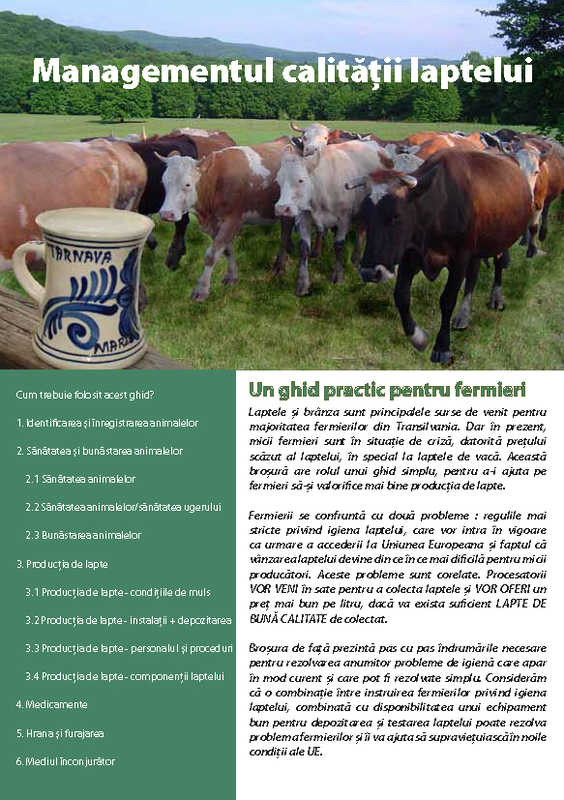 This simple guides has immediately helped farmers across Romania achieve higher prices for their products, with an immediate impact on farm incomes and farm viability, by providing simple, practical solutions to farmers problems. This publication is meant to highlight the importance of the individual household as a basic element in the organization of the contemporary world. A practical guide for farmers. This brochure provides step-by-step guides to solve some common hygiene problems that can be solved simply. We believe that a combination of farmers' milk training combined with the availability of good equipment for storing and testing milk can solve the problem of farmers and help them to survive in the new EU conditions. Social Enterprise is a new type of initiative, which proposes to solve a social problem by specific methods. 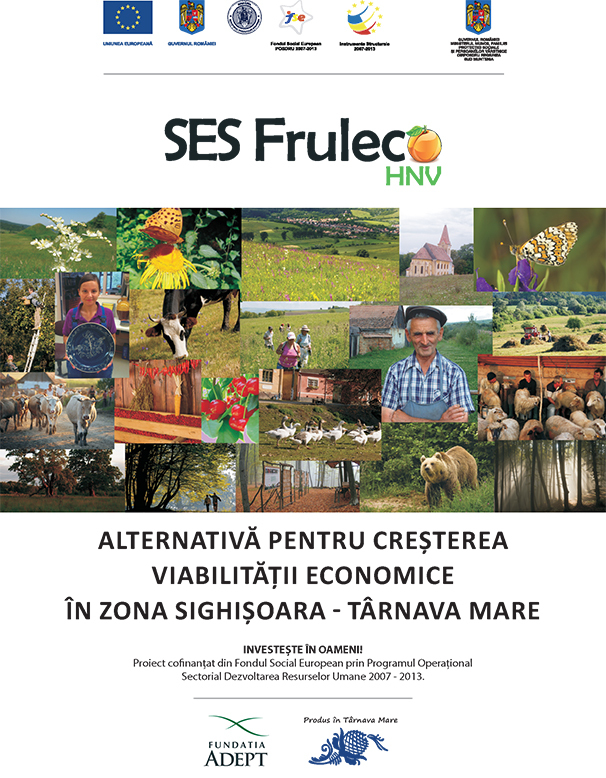 The establishment of the SES Fruleco HNV is a continuation of ADEPT's activities to support small producers and, implicitly, to protect landscapesHigh Natural Value Farm (HNV) in Transylvania. 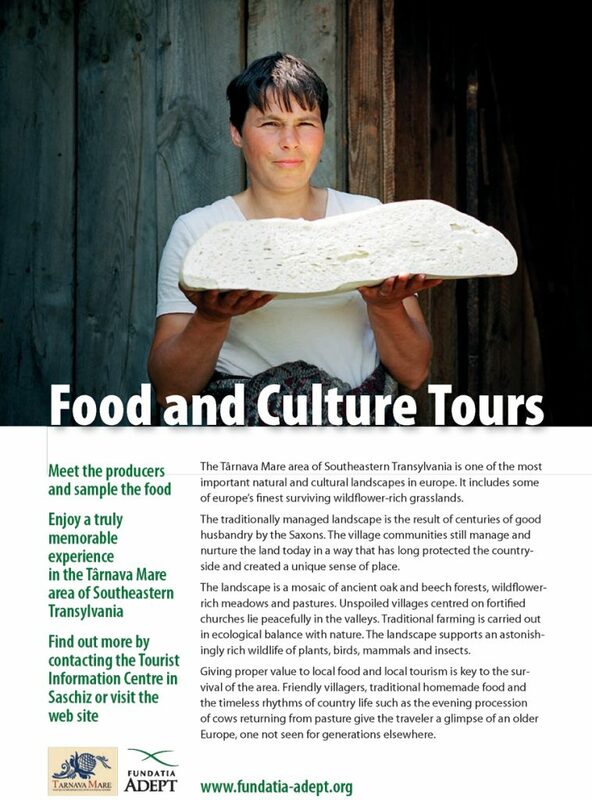 This brochure offers information from our own experience about how the local producers should sell their products, why it's important to be different and how to get closer to the consumer. 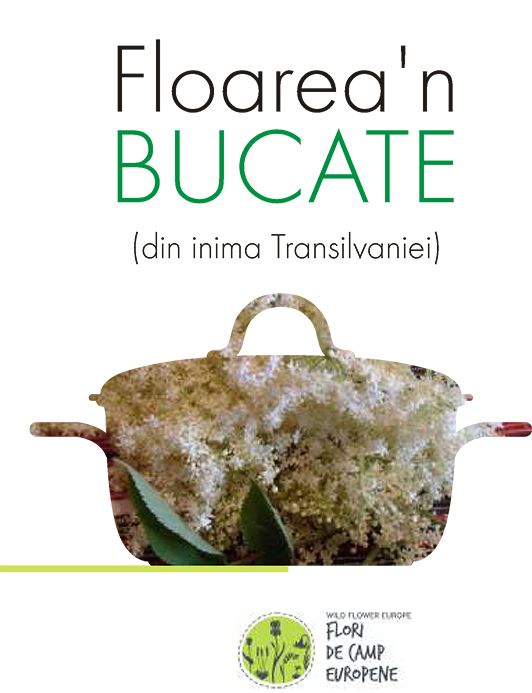 Success lies in the local economy, in local products, different from the industrial ones, in the preference of Romanian consumers for traditional products. This simple guide presents the stages to be followed when building a new mountain bike trail sharing from ADEPT own experience and success. 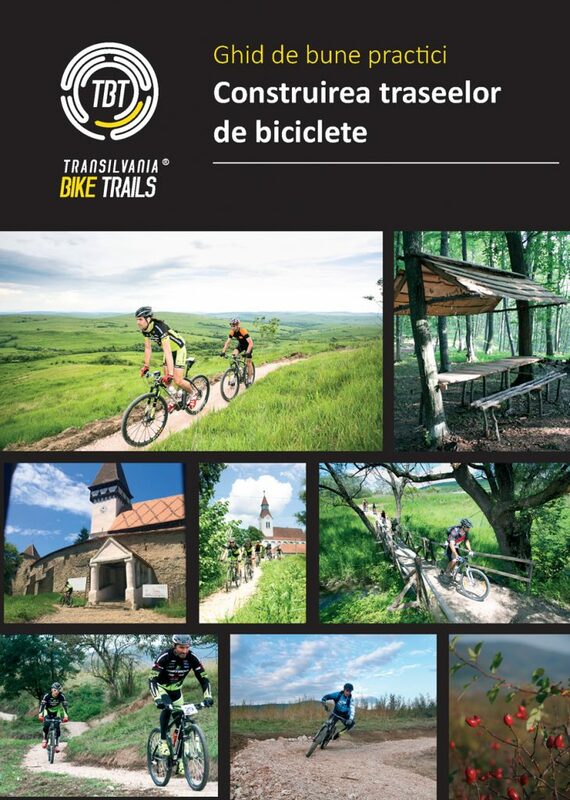 The guide offers information about the the slope of the paths, how to draw crossings of watercourses protecting the aquatic ecosystem, how to build bridges or how to mark the trails. 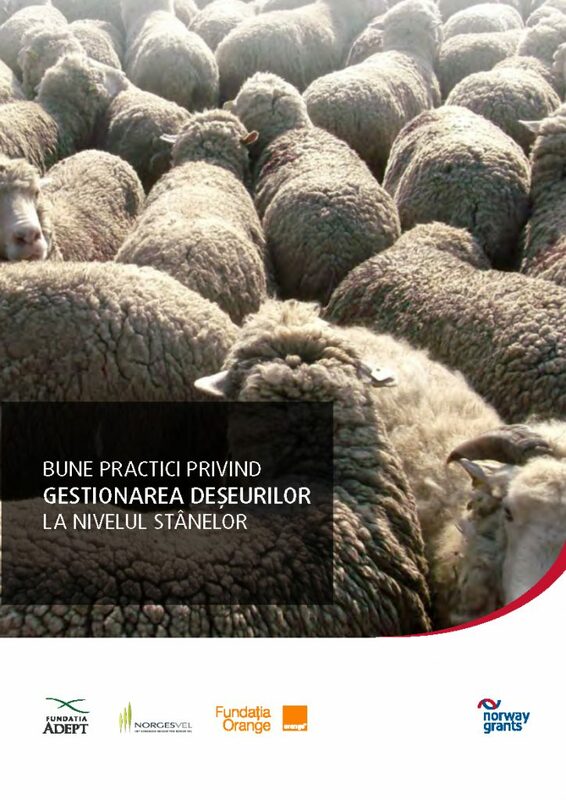 A short description of the general pollution prevention framework generated by waste from non-intensive agricultural activities, elements related to the pattern of biological activities in sheepfolds, production and management of waste, requirements for the storage and use of manure from the sheep, proposed measures for the management of household and assimilable waste and the storage of natural organic fertilisers. 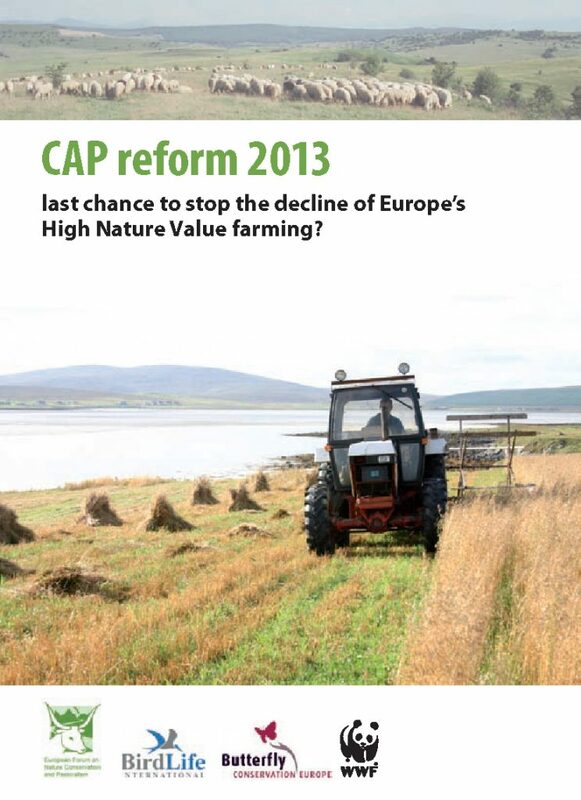 The policy document describes the need for targeted support of HNV farming systems, and proposals for achieving them under the CAP post 2013. 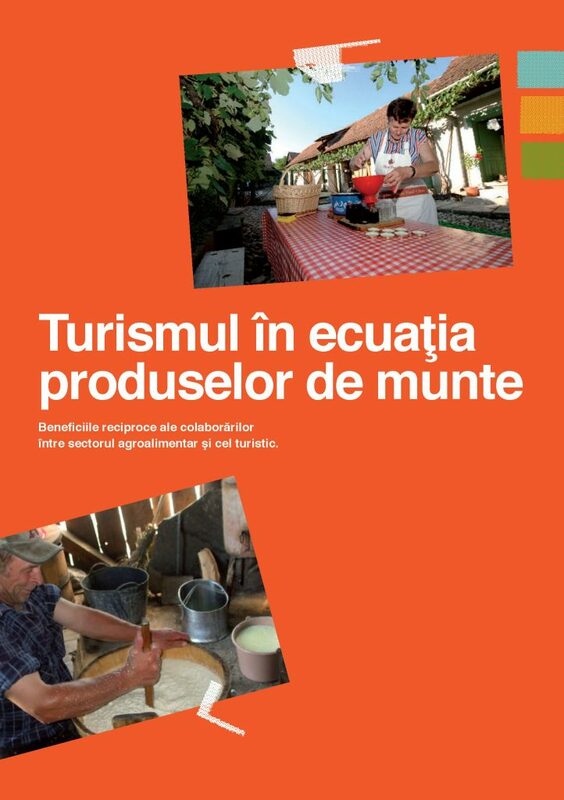 The mutual benefits of cooperation between the agri-food and tourism sectors. Recommendations for farmers, processors, distributors and traders of mountain agri-food products, as well as the common benefits of successful cooperation. Recommendations for labeling, promoting and marketing products in the mountain area - ensuring success on the market. When we shop for food, our choices are affected by a number of factors, the most common being price, advertising, personal taste and health effects. Other factors – such as the effect our purchases have on the environment, on the local economy and on the landscape – are less immediate but just as important. 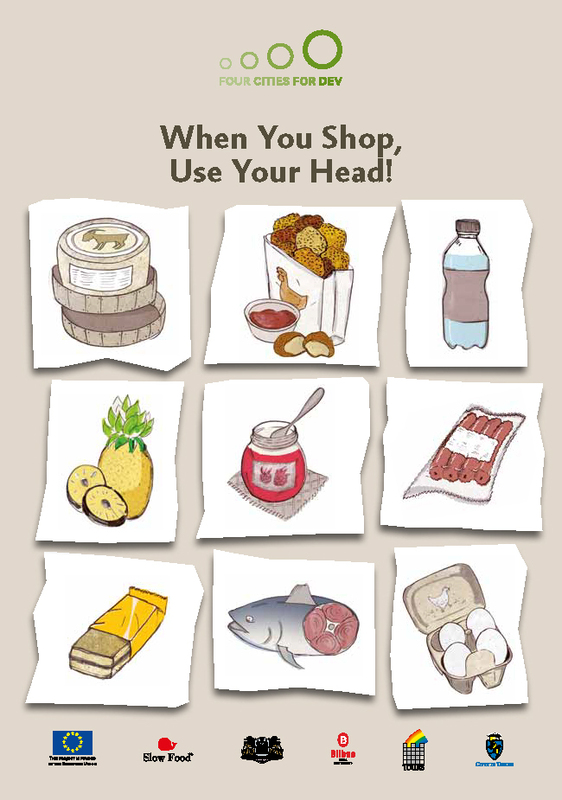 This brief guide will help you to be more aware of the consequences of your daily choices. 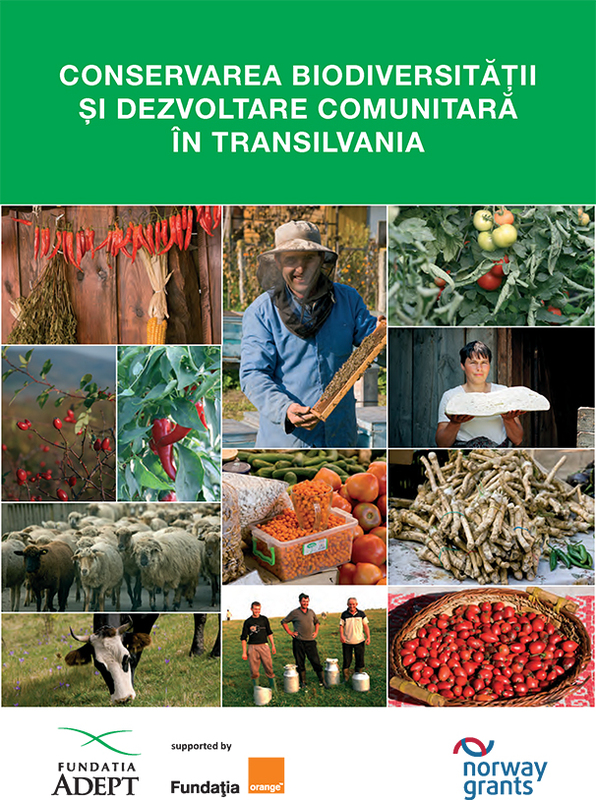 This publication is a working tool for community facilitators within the project "Economic Development of areas with High Natural Value ". 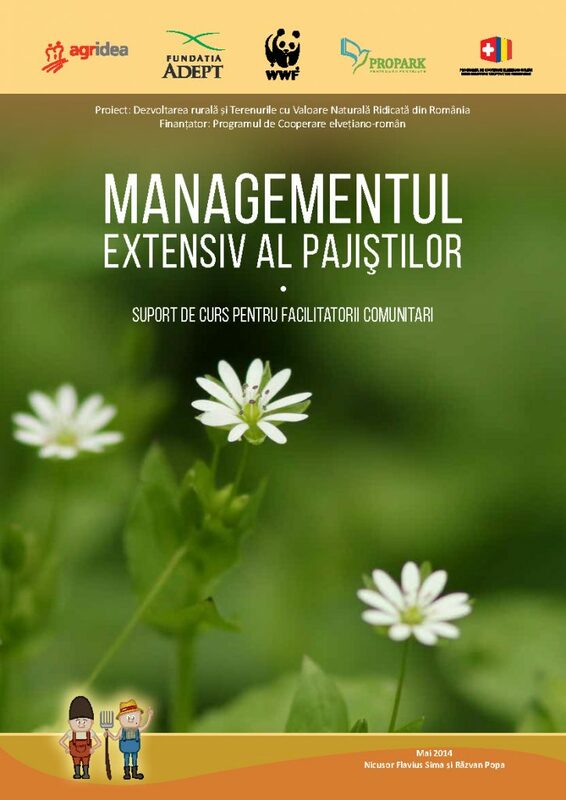 Course support addresses the following topics: extensive grassland management; the meadow and its place in the global economy and Romania; plants of other botanical families; practices for the use of recommended meadows in order to achieve a balance between obtaining appropriate production and preserving biodiversity; rehabilitation of degraded permanent meadows, etc. 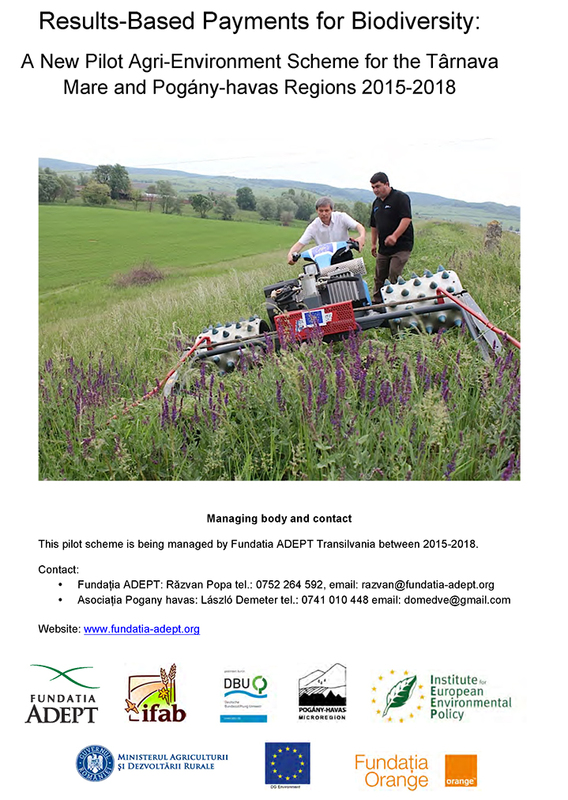 This material represents the support of the marketing course developed within the project "Areas of High Natural Value and Rural Development in Romania" and supported by ProPark on 27-29 July 2014 in Baile Boghiş, Sălaj, training delivered to the community facilitators. This manual will help future community facilitators address the needs expressed by project end-users in each pilot area. It is designed to provide the latter with a few basic notions of product orientation to the market. The manual presents rules and conduct in processing local products in High Nature Value (HNVF) areas. "The socio-cultural, territorial and natural importance of HNV systems is increasingly recognized internationally, but there is a need for awareness among decision-makers and the general public." This publication is a working tool for community facilitators within the project "Economic Development of areas with High Natural Value ". 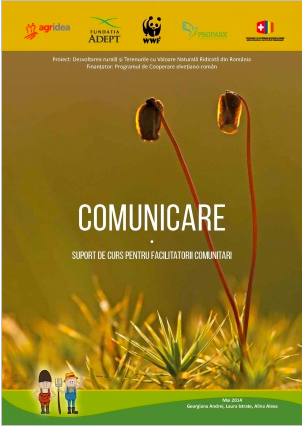 The brochure includes a description of the project, the role of community facilitators, basics of communication, facilitation and motivation techniques. 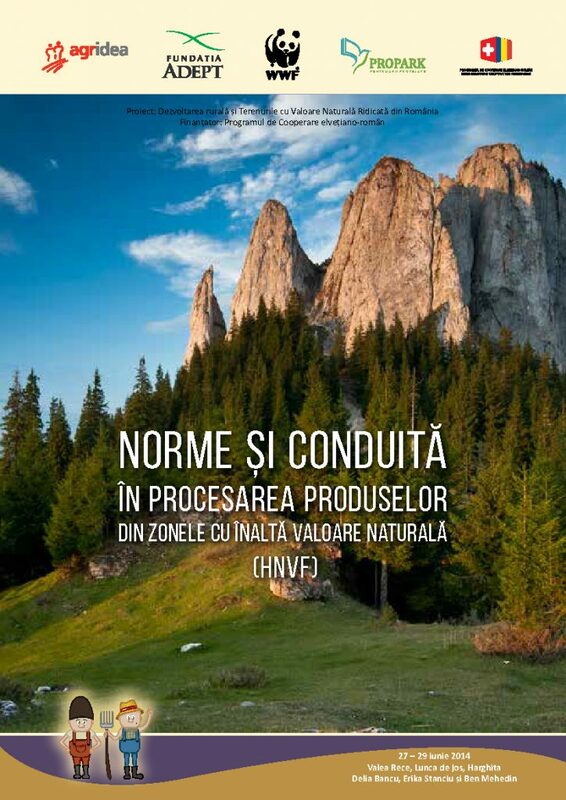 The course, developed as part of the Community Facilitator's Preparation Package, by ProPark under the project "Economic Development of High Natural Value Areas", presents some basic elements of the Association. The manual also presents marketing elements as well as other topics presented in the trainings organised under the project. This material aims to provide basic information about project management cycle, starting with programming, identification, preparation, financing, implementation and evaluation. The material contains information about different types of funding and financing measures. There are several "ingredients" that make a financier's approach successful. 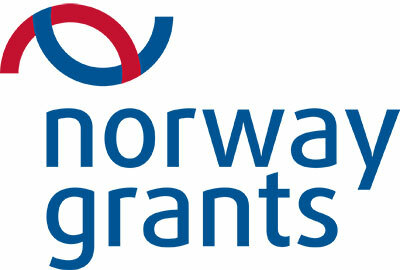 A well written application for funding, the credibility of the organization and the persons involved in the project. The way in which a financing proposal is prepared differs from one funder to another.